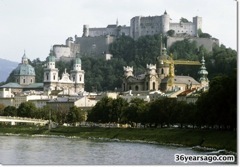 Mozart’s birth city — Salzburg, Austria. I take my first train ride, totally standing up, to this wonderful city. Salzburg welcomes me with a hail storm and no student service to help me. What to do? Find a room, walk around, listen to music, and enjoy. Which I do. Photography is my hobby and Salzburg is a great place to take photographs. (Photos coming soon.) If you aren’t already taking digital pictures, you should be. Come on. Pictures are memories!